Distinguished entrepreneur, former Board of Trustees Chair Oliver T. Carr provided funding to establish professorship. More than 20 years ago, James Foster’s groundbreaking scholarship on poverty had already gained international attention, as his work provided an approach for the Mexican government to better identify the communities that most needed assistance. That program grew to reach six million households in Mexico or about 1 in 5. And today, the research of Dr. Foster and his colleagues has been used to address poverty in dozens more countries around the world. President Steven Knapp said, but also for his work to revitalize downtown Washington after the riots of the late 1960s. Mr. Carr previously funded The Oliver T. Carr, Jr. Scholarships in Urban and Regional Development and the Oliver T. Carr, Jr. Professorship of Urban and Regional Development, both in the GW School of Business. He received an honorary Doctorate of Public Service from GW in 1998. Mr. Carr is “known at GW for his generosity, his loyalty and his dedication to our mission,” ESIA Dean Reuben Brigety II said. “That’s what matters most,” he said. Dr. Foster added that his “impossible dream” is to reassess how the United States defines and measures poverty. Currently, he said, the country uses a monetary indicator developed in the 1960s using 1950s data. And his promise to Mr. Carr? 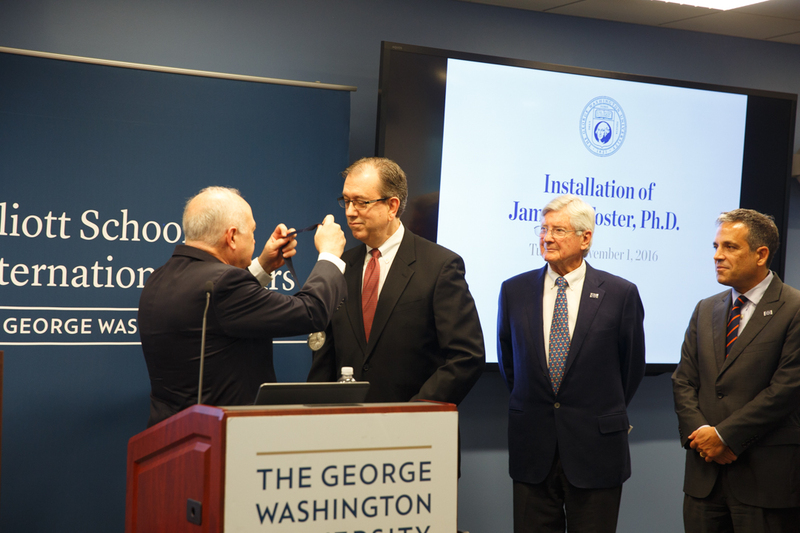 “I will wear your name and title of my professorship with pride and honor,” Dr. Foster said.